Puzzle Room Escape-29 info about the game-Games2Rule. 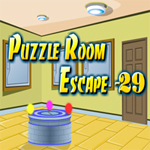 Puzzle Room Escape - 29 is Twenty Eighth episode of Puzzle Room Escape point and click room escape game series from Games2rule.Puzzle room to test your ingenuity!! Try your skills at solving brand new puzzles and escape from the puzzle room ingeniously.